The Iowa baseball team leads off the 2016 season Friday-Sunday at Dallas Baptist. 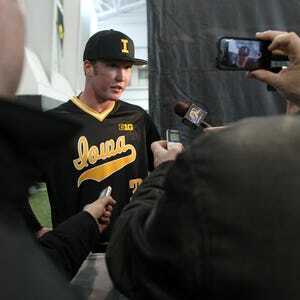 There is a buzz around Iowa baseball, and for good reason. Iowa finished 41-18 in 2015, advancing to the NCAA Tournament for the first time since 1990, winning an NCAA Tournament game for the first time since 1972 and recording the program's second-highest single-season win total. The Hawkeyes return four positional starters, two starting pitchers, and nearly their entire bullpen. Plus, the highest-rated recruiting class in the Big Ten joins the dugout. Iowa seems primed for another solid season in Year 3 under coach Rick Heller. "I don’t think there’s any pressure," Heller said at the team's media day last week. "This year’s team is different. Different guys, different leaders. But the foundation was laid by the guys last year. This team is fired up to go out and play and see where we’re at. We’re trying to take the program forward. That will always be the goal." There is no shortage of strong opponents dotting the Hawkeyes' spring schedule. Heller's club opens the season this weekend with three games at Dallas Baptist, which racked up a school-record 46 wins en route to an NCAA Tournament appearance last year. Patriots coach Dan Heefner is an Iowa City native and was an assistant coach in 2002-03 for Heller at Northern Iowa. This season will help show how Iowa attempts to sustain success. Heller is 71-41 in two seasons, making him the winningest coach in his first two years in program history. "I’m going to be looking for more than the results," Heller said. "It’s going to be the culture. How we’re handling our business, how we’re dealing with failure, (and developing) that confidence that you really need to last a long season to be able to compete day in and day out. Then, just flat-out how we go out and compete against a good team." Senior right-handers Tyler Peyton (7-4, 3.03 ERA) and Calvin Mathews (5-3, 2.45 ERA) return to the rotation as the team's Friday and Sunday starters. The Saturday starter spot is up for grabs among junior left-hander Ryan Erickson and sophomore righties C.J. Eldred — son of former Iowa pitcher Cal Eldred, who pitched 14 years in the major leagues — and Nick Gallagher. Seniors Tyler Radtke and Luke Vandermaten anchor the bullpen. Erickson will also be a key reliever if he isn't in the rotation. Peyton is the headliner on offense after hitting at a .337 clip with 31 RBIs in 2015. Peyton — who plays first base when he's not on the mound — and senior teammates in shortstop Nick Roscetti, outfielder Joel Booker, and catcher Jimmy Frankos are the returnees on the diamond. Additionally, projected starting second baseman Mason McCoy brings experience from the junior college level, where he hit .394 as a freshman and .382 last year as a sophomore at Illinois Central. "We’re going to try to do what we know how to do this season — play the game hard, and hopefully by playing the game hard, success will come with that," Roscetti said. Can Iowa ultimately build upon the last two seasons for a strong 2016 campaign? The Hawkeyes are picked to finish fourth in the Big Ten in a poll by the coaches. Michigan is first, Maryland is second and Indiana third. "Coach Heller preaches every day is a new day," Mathews said. "We don’t really know what’s going to happen. Obviously, we’d like to win 41 games again, but every day is different and we’ll try to get one game at a time."